Guest post from Emma Hallett (Project Manager) at Design Lab about an exciting project: Recycling is one of the most widely adopted environmental actions in the UK – three-quarters of us see ourselves as “committed recyclers”. However, even when you have done all you can to reduce, reuse and recycle items, there can be a frustrating amount of stuff still in your bin. 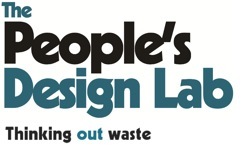 The People’s Design Lab offers a new solution. The products and materials we send “away” as waste represent a loss to our economy both in environmental and economic terms. 80% of the environmental impact of a product is locked in at design stage. Waste disposal creates around one job per thousand tonnes per year while reuse and remanufacturing can create up to 10 to 25 times as many jobs (one job per 40- 100 tonnes per year). The Peoples’ Design Lab wants to nurture zero waste design, maximising reuse and recycling – keeping resources circulating in local economies. The People’s Design Lab needs your help to create this change. We’ve had more than 100 nominations for products which you can’t recycle, compost, reuse or repair. Now we’re asking you to vote for the finalists in our awards. Award winners will be redesigned over the summer! Vote on our website or on facebook before 19th June. Every vote strengthens the Lab’s voice with manufacturers so please pass this on and help turn the hundreds supporting the Lab into thousands! To find out more click here or just vote! We also have an award for the best zero waste designs, to contribute to the good design debate and help unpick the very real challenges we face in tackling waste as a society. 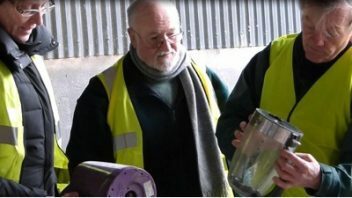 The catalyst for the Lab was a Zero Waste pilot project in Presteigne, Wales managed by social enterprise Cwm Harry. The community of Presteigne recycled an amazing 74% of their rubbish, but felt frustrated by the things still ending up in their bins. They came up with a list of things that you can’t recycle: from cat food pouches and plastic on cucumbers to products that break and can’t be fixed such as children’s toys. They called it the “Grrr List” and took it to an advisor at The Ecodesign Centre. Answers were complicated… for example, plastic on cucumbers extends the shelf life by six weeks. Then they found that most of the waste electronics sent for recycling by the community were not really broken. The process of unpicking waste had begun. Drawing inspiration from the Italian Museum of Bad Design (see box), the People’s Design Lab is harnessing the collective intelligence of the community find new solutions to waste. The lab takes a starting point that “if a product can’t be reused, repaired, refurbished, recycled or composted it, it needs to be redesigned or taken out the system”. The Piccolo Museo degli orroridi progettazione (Little Museum of Bad Industrial Design), based in Capannori in northern Italy researched what was in their waste. Amongst other items they found lots of Lavazza coffee capsules in their residual waste. They worked out that 12,000 tonnes of capsules went to landfill a year and decided to take the issue back to the company. Lavazza invited them to collaborate in developing a solution and two years on, they are about to launch a pilot for their new design.